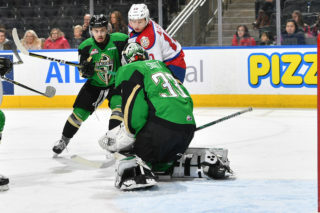 For the second straight night the Edmonton Oil Kings peppered the Medicine Hat Tigers with shots, but this time the outcome was very different. 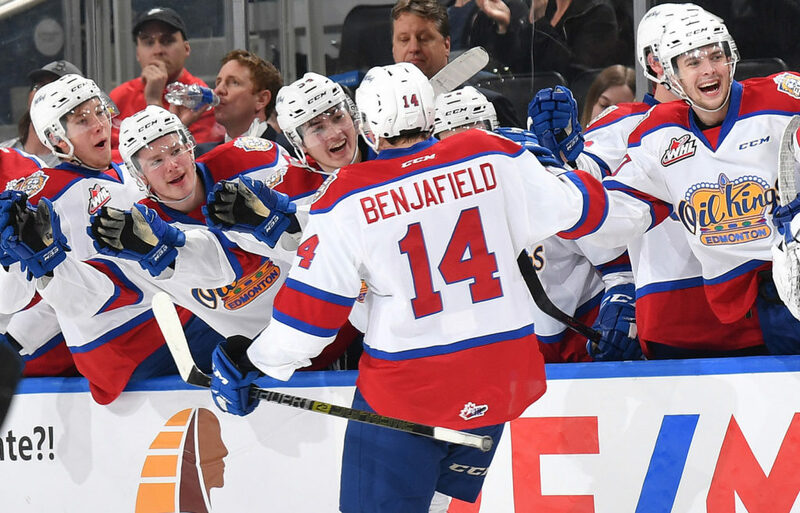 Quinn Benjafield broke open a 3-3 tie with the eventual game-winning goal with just 2:56 remaining in regulation, propelling the Oil Kings (1-1) to a 4-3 win over the Tigers (1-1) in Game 2 of their best-of-seven Eastern Conference Quarter-Final playoff series in front of 5,671 fans on Sunday night. 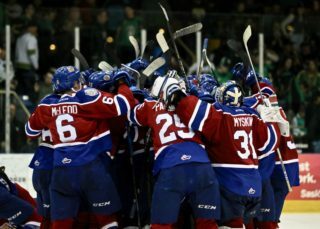 The Oil Kings were again dominant when it came to the shot clock, registering 41 shots on goal in the winning effort. Through Games 1 and 2, Edmonton has fired 91 shots on Mads Sogaard, while the Tigers have managed 48 through the opening two contests. 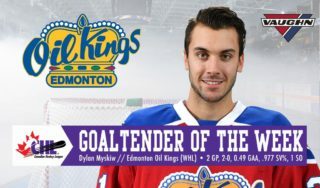 Dylan Myskiw (1-1) earned his first WHL playoff win as a member of the Oil Kings, turning aside 18 of 21 shots strewn his way. 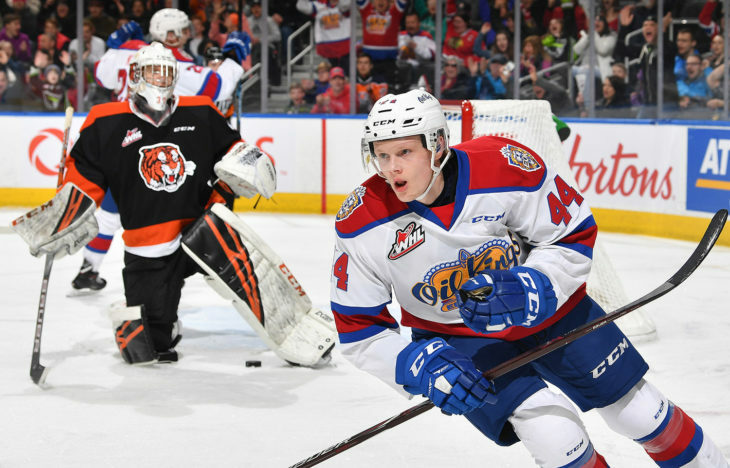 Sogaard (1-1) was tested early and often again by the Oil Kings and this time was beaten four times on 41 shots. 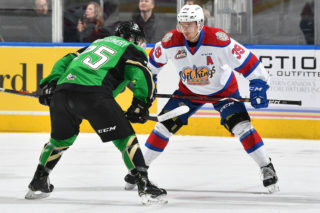 This time it was the Oil Kings who opened the game’s scoring, as Liam Keeler buried a beautiful feed from Josh Williams while on a 2-on-1, with the second assist to Jake Neighbours at 2:26 of the first period. Just past the midway point in the frame, the Tigers gained a power play opportunity after a scrum in front of the Oil Kings net produced just one roughing penalty to Myskiw and Medicine Hat capitalized. Just over three minutes later Nassen, who scored the first Tigers goal, struck again to give the visitors a 2-1 lead at 14:39, from Ryan Chyzowski and Brett Kemp. It was how the game would head into the first intermission, with Edmonton leading the shot clock 13-4. 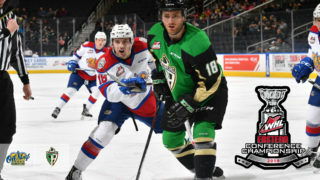 In the second period, the Oil Kings once again made it a tie game and did so in one of the most exciting ways to the delight of the crowd – during the Popeye’s Chicken Minute. 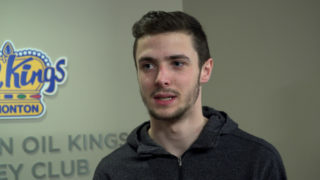 Vince Loschiavo became the second Oil Kings player to hit the milestone this season with his first of the playoffs, tying the game 2-2 on the power play, from Conner McDonald and Trey Fix-Wolansky at 12:49. Nearing the end of the frame the Tigers reclaimed the lead, 3-2, on a goal-mouth scramble in front of Myskiw which was eventually credited to Kemp – their second power play goal of the game – to close out second period scoring at 18:42. Carter Souch presented the game’s fourth stalemate of the evening when he tallied his first of the post-season by going top corner past Sogaard at 7:25, with Andrew Fyten earning the lone assist. With time winding down, Benjafield’s first of the season proved to be the last of the see-saw goal-scoring affair, potting what would be the game-winner at 17:04. Parker Gavlas picked up the only helper on the goal. Edmonton outshot Medicine Hat 18-8 in the second period, and 10-9 in the third for a game total of 41-21. Medicine Hat was 2-for-3 on the power play, while Edmonton finished the game going 1-for-2 with the man advantage. Liam Keeler (EDM) (3), Linus Nassen (MH) (2), and Quinn Benjafield (EDM) (1) were selected as Three Stars of the Game. Game 3 goes Tuesday night, March 26 at the Canalta Centre in Medicine Hat at 7:00 PM MT. Game 4 will take place the following night, Wednesday, March 27 – also on the road – for a 7:00 PM start. Game 5 will take place on Friday, March 29 back at Rogers Place at 7:00 PM MT. Tickets will go on sale tomorrow morning, Monday, March 25 at 10:00 AM MT online here.